There’s no secret that Malacca (also Melaka) is top weekend getaway for residents of Singapore. Getting there and getting around is easy, language barrier is minimum as English is widely-spoken, attractions are within close vicinity so planning the trip is rarely a hassle, prices are dirt cheap and it can be done within 2 days so you never have to apply for leave to get a holiday! Similar to Tioman Island or these other Malaysian destinations you can get to without a flight. . But practicalities aside, Malacca truly shines because it’s a city brimming with character. Its Peranakan culture is vibrant, there are plenty of beautiful houses, and most of all, delicious food which are familiar enough for a Southeast Asian palate but distinctive enough that you actually bother to travel for it! Indeed, Malacca has impressed the international community enough that it earned a UNESCO World Heritage Site status, making it the closest world-class attraction from neighbouring country which you can get to from Singapore. There are plenty of buses leaving from Singapore to Malacca daily, with the earliest one being at 7am. The entire journey will take you approximately 4 hours, so start your day early, cross the border, catch up on your beauty sleep and wake up in a UNESCO World Heritage Site! Most buses will stop at Melaka Sentral, which is the largest transportation hub in the city, but this is slightly farther from the city centre so we do not recommend this stop. There are several buses which will bring you to hotels nearby to Malacca’s historical heart. The closest hotel where buses make a stop is Casa del Rio Melaka, hence this is our most recommended stop if the ticket is still available. However, any buses which make a stop at Dataran Pahlawan area (Hatten Hotel, Estadia Hotel, Hotel Equatorial Melaka, as well as the Dataran Pahlawan stop itself) are also good enough. Check in to your hotel, quickly refresh yourself, leave your bags behind and start exploring! Start your trip with a feast at Nancy’s Kitchen where you will try Nyonya Peranakan cuisine, a specialty of Malacca city. Try the classic Peranakan dishes such as chicken/pork rib with buah keluak (black nut) and nyonya chap chai (mixed vegetable). But also try the restaurant’s signature dish, which is ayam buah keras (chicken candlenut). Have room for more? Then you might want to take a bite on their authentic fusion dish of sayur loday (mixed vegetable with coconut milk), which mixes influences of Malay, Indonesian and Nyonya cuisine. We absolutely recommend visiting Malacca with a big group of friends and order only one portion of each dish to share. Eat less of each dish, but stuff your stomach with varieties of deliciousness! Now that you’ve gained all the energy you’ll need from all that delectable food, it’s time to dive headfirst into the fascinating world of Peranakan culture. This is not an ordinary museum, but it is actually a house of a Peranakan family which has lived there for four generations! Comprising of three terrace lots and with history dating back to the 19th century, there is no better way to immerse yourself in the world of Peranakan history than understanding how they go about their daily lives, and this makes Baba & Nyonya Heritage Museum one of our top favourite Southeast Asian museums! Though the families themselves do not exactly live there nowadays, it is still being managed directly by the family so the experience is informative yet very authentic. So who are the Peranakans exactly? It’s tempting to stereotype them as part-Chinese, part-Malay and leave it at that, but that’s really oversimplifying things! Though their roots of ancestry can be traced back to the Chinese immigrants who came to the Malay archipelago and married the locals, they have created their own unique culture and blend of identity which is neither Chinese nor Malay. Even more uniquely, Peranakan culture is very micro-specific to Malaysia, Singapore and small parts of Indonesia, that it becomes a local pride not typically found elsewhere in other parts of Southeast Asia. This makes it a truly unique case of successful cultural assimilation. You can also see Peranakan culture and heritage in Singapore at the Peranakan Museum, here’s a list of Singaporean-specific museums you can visit. 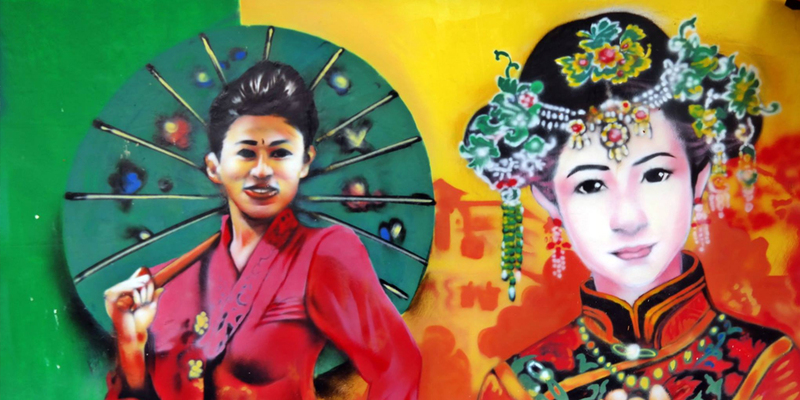 Spend the late afternoon meandering through the streets of Melaka along The Well area to discover the authentic faces of Melaka, passing through numerous beautiful street art that decorate the river side. 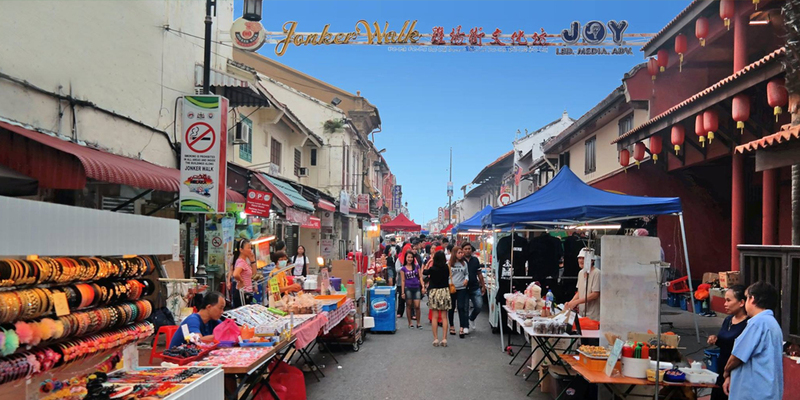 Jonker Walk is the heart of Malacca. This is where you can observe elaborately decorated and colourful Peranakan houses, as well as shophouses selling antiques, textiles, handicrafts and souvenirs. Around the evening time, this entire street booms into a dynamic night market with plenty of tasty street food waiting for you to sink your teeth into! Here are our favorite must-eats in Jonker Walk: popiah, gula melaka cendol, chicken rice balls, nyonya assam laksa at Jonker 88, quail egg, pineapple sauce satay, and finish off with deep-fried ice cream! But really, just wander around the streets and see what catches your eyes, there is just so much mouth-watering awesomeness you have to see it for yourself! Start your morning crossing over to the other side of the Melaka River where you can find the Dutch Square. This is where all the iconic Instagram shots of Malacca are taken on. This quaint square is built entirely in red bricks which makes it superbly photogenic, with equally eye-catching all-red landmarks like the Christ Church, Stadthuys, Clock Tower and a Dutch windmill. 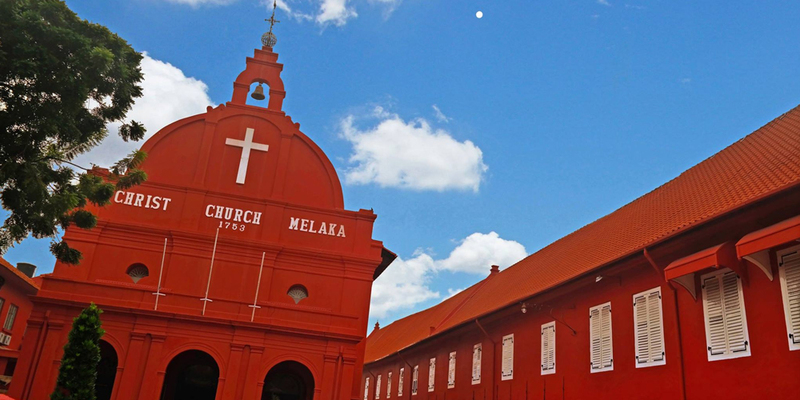 Continue through the beautiful back streets of Malacca to the St. Paul’s Church. This historic church goes all the way back to 1521 and its pleasant location at the summit of St. Paul’s Hill makes it an interesting structure to visit. The wear-and-tear of the chapel clearly shows itself, which adds to its rustic charm and makes it completely hipster-worthy. Proceed down the hill into the equally rustic Portuguese fortress of A Famosa, which is among the oldest surviving European-styled architectural remain in all of Southeast Asia. Touted by many as the best Peranakan restaurant in Melaka, Amy Heritage is one place you should absolutely make reservations for beforehand as it is incredibly popular. This is no surprise after you have tasted the tongue-tickling dishes like Nyonya Pai Tee (crispy deep-fried puff stuffed with vegetables) and Chap Chai (mixed stir fry vegetables in bean paste). Again, eat less of each food and order more! After all the fancy Peranakan food, wash it off with something more contemporary. Nadeje’s impeccable layered handmade mille crepe is flavourful and soft in every bite. It is a hot favourite and queues build up, but it’s completely worth the wait! After the sumptuous lunch and sinful dessert, head to Dataran Pahlawan for last-minute shopping. Here is where you can get some really good stuff for ringgit prices instead of the usual hole-burning Singapore dollars. Or you can also watch movies for dirt cheap prices. This is the ultimate indulgence in modern comfort before you return to the cruel Monday life, so make it count! Take your 4-hour bus ride home. Remember that there are also many people who will want to cross the border back to Singapore as it’s Sunday, so we absolutely recommend to take the late afternoon bus home which arrives in Singapore no later than 8.30pm so that you get enough time to sufficiently rest before the impending Monday doom comes. But as for now, it’s a wonderful weekend well spent! Kota Lodge’s rooms come as low as SGD 15-46. With air-conditioned rooms and the popular Jonker Street just a 5-minute walk away, this is the best deal in town you can get if you are on a tight budget. More rates, photos and availability on HotelsCombined and Agoda. Hotel Equatorial Melaka is a decent option for those who favour value-for-money accommodations without sacrificing comfort. Its strategic location which is sandwiched between Malacca’s historic heart and the more modern side of the city means that you can easily access both the major attractions and present-day comforts like shopping malls within walking distance, all in a reasonable price range of SGD 67-122. Casa del Rio Melaka’s 5-star property is conveniently located within a stone’s throw away to all major attractions in Melaka and comes with a beautiful river view. Room prices may range from SGD 194-912, depending on your room type. There are also spa facilities for you to wind down after a day out in this historic city. Malacca is very easy to get to. There are plenty of bus companies such as Delima Express, KKKL Express and 707, Luxury Coach Service, Starmart Express, Konsortium, Lapan Lapan Travel, Superior Tour, The One Travel & Tours serving the route between Singapore and Malacca multiple times daily. Once you are in the city centre, getting around by foot is an easy breeze. If you would like to go somewhere a little further, metered taxis are everywhere and easy to flag down. They typically cost around 7 ringgit per trip if you’re travelling within the city. Uber and Grab are both available too. There is no time difference between Malacca and Singapore. Malacca is ideal to visit at any time of the year. However, the driest months are April, May and October, so if you want to avoid gloomy days at all costs, these are your best bet for a trip to Malacca! Malacca has a similar weather to Singapore so make sure to bring some stylish travel clothes for women as well as an umbrella, the weather is as unpredictable as in Singapore!